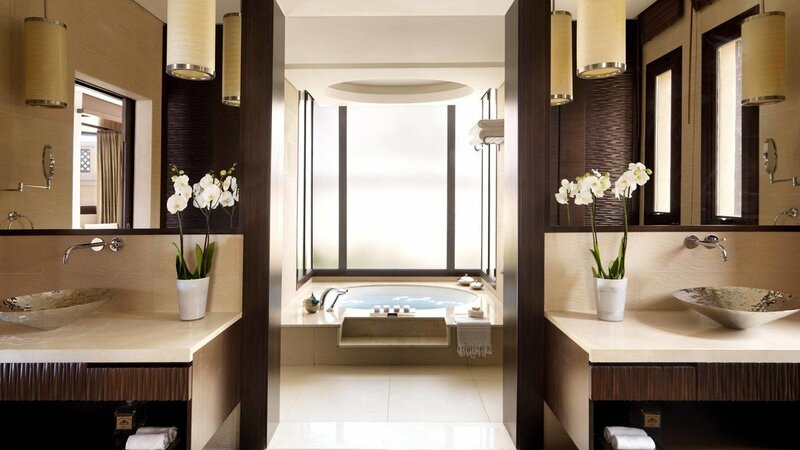 A stunning Palm Jumeirah hotel, Anantara The Palm Dubai Resort evokes feelings of luxury and serenity in decadent style. An iconic splendour exudes from this resort where a selection of low-rise villas and rooms perfectly accommodate privileged guests. 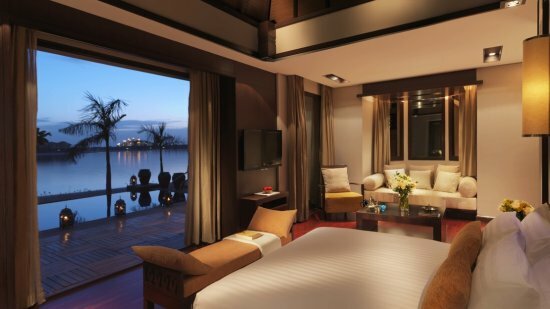 Lagoon views, perched over the water or alongside the beach, some apartments also offer a personal infinity pool, and there are unique glass viewing panels in the 'Over Water Villas'. A plethora of services such as enriching spa treatments, beach relaxation or exhilarating water sports, shopping, and dining all combine to create a tranquil Anantara experience that's second to none. The resort has a 400m private beach with luxurious sun loungers and a refreshing drinks service. 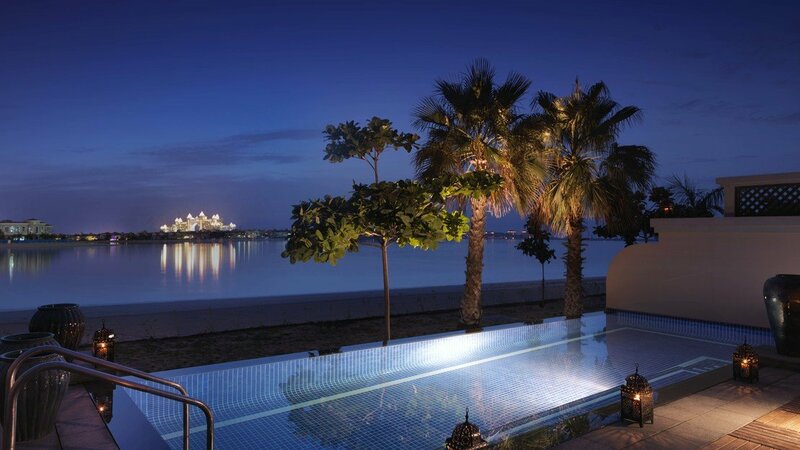 Anantara The Palm Dubai Resort is located on the east crescent of the famous Palm Jumeirah Island. The Dubai Marina is 15km away, or to practice your swing in the sun, Emirates Golf Club is 17.5km. The iconic Burj Khalifa, is approximately a half an hour journey, where you’ll also find fabulous shopping opportunities at the Dubai Mall. Aquaventure Waterpark is a fun-filled day out, just 4.5km away at the tip of The Palm. 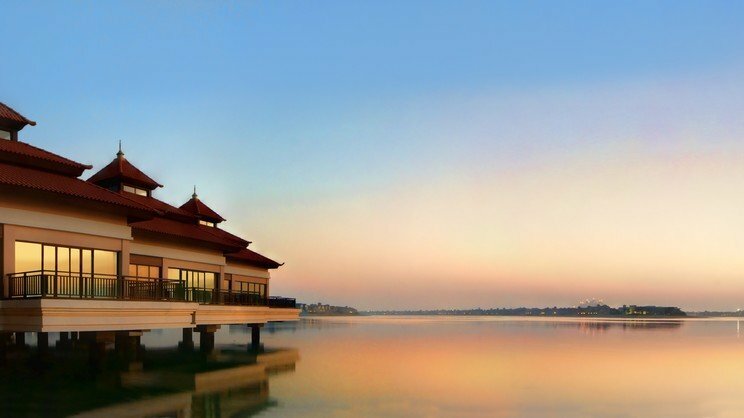 Dubai International Airport is approximately a 45-minute drive away from Anantara The Palm Dubai Resort. Manicured gardens and enticing pools lead guests into 47 square metres of pristine lagoon view rooms. 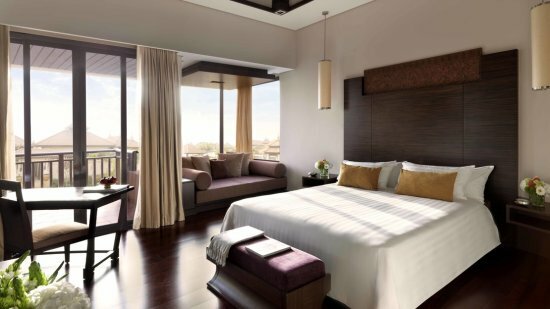 Furnished with a contemporary decor and neutral tones, with rich dark wood signature pieces, these rooms offer a relaxing oasis after a day sightseeing. 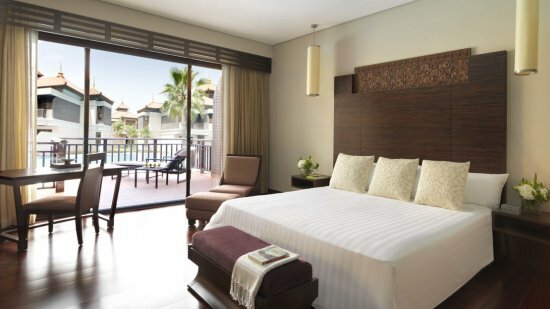 Looking out over lush gardens and swimming lagoons, Deluxe Lagoon View rooms offer the choice of a king-size or twin-beds and a further day bed. Combining the serene lagoon setting with a relaxing private terrace, and direct access to the surrounding pool, these beautiful rooms offer 47 square metres of living space. 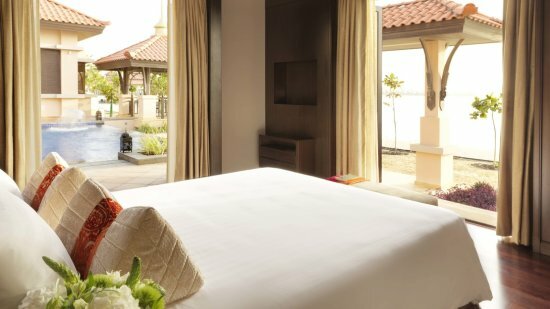 Accommodating up to 3 adults and 1 child, these 52 square metre rooms offer indulgent relaxation with direct access to the lagoon pool, perfect for sampling the cocktail created by the floating mixologist as you soak up the ambience. 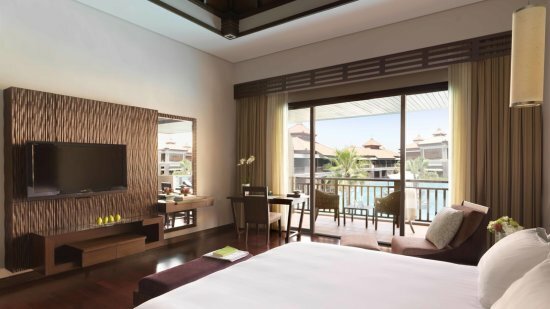 Direct access to the stunning lagoon pool from the private terrace and a host of Anantara amenities ensures these rooms are perfect for up to 3 adults and 2 children. A generous 65 square metres is filled with stylish design touches in a bi-level layout. Beautifully decorated to reflect the ambient location and provide complete serenity, this stunning 106 square metre villa is poised over the lagoon waters, some with a unique viewing panel into the underwater world. There's a beautiful terrace from which to enjoy breakfast organised by your personal villa concierge in addition to oversized soaking tubs looking out over the mesmerising views, perfect for a romantic evening with your loved one. 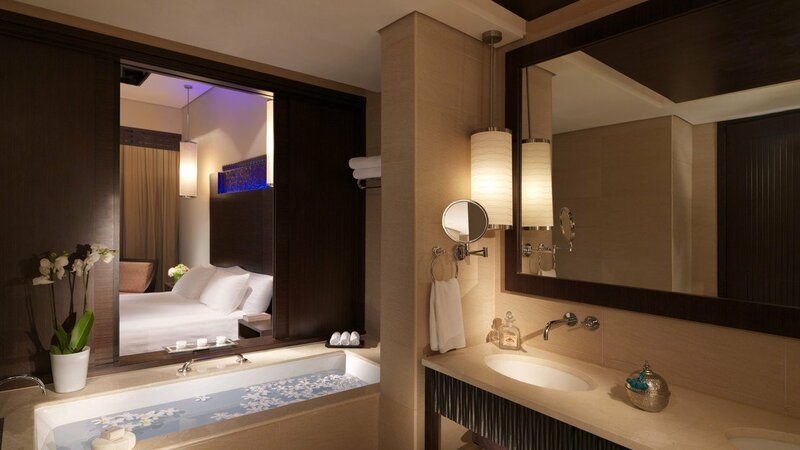 85 square metres of superior accommodation offer privileged guests the chance to unwind in a gratifying mix of lavish Asian-inspired decor and furnishings. Take the stunning views from the ensuite soaking tub, the private dining organised by your personal villa host or the private infinity pool that's situated just in front of the ocean. The magical setting of which allows for direct access to the sandy shores of the Arabian Gulf. As day turns to night, the beach becomes illuminated by a mix of twinkling lights, perfect for romantic evening strolls. 206 square metres of exceptional accommodation influenced by Asian decor and rich woods against neutral tones, this incredibly stylish villa serves families perfectly adding to the serene ambience with a mix of privacy and space. Indulge in the location with a private infinity pool and direct access to the beach. One king- and one twin-bedroom each features its own ensuite, there is a spacious lounge and dining room plus a kitchenette. The private infinity pool can be accessed from both bedrooms and for any further luxuries, the personal villa host will happily tend to your requests. Fabulous International buffets are served here for breakfast, lunch and dinner in a very stylish elegant setting. Transporting you through Thai, Chinese and Vietnamese traditions and tastes, this superb venue is the base to enjoy the very best dishes from these vibrant countries. Enjoy prime cuts of meat and beautiful seafood prepared under Parilla grills and charcoal ovens followed by cheeses and dessert of your choice. Mediterranean specialties are served in this light and airy restaurant throughout lunch and dinner hours. Savour International cuisine and refreshments in a contemporary setting. Perfect for pool service until 8pm each evening, snacks, light lunches and a plethora of refreshments can be enjoyed here. Private dining on the beach or in-room combining the exotic flavours of Arabic with Mediterranean and seafood classics ensures a beautiful finishing touch to an aready romantic and indulgent break. 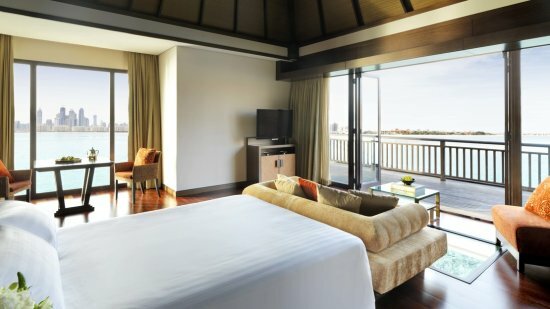 Guests staying at Anantara The Palm Dubai Resort can enjoy Bed and Breakfast, Half Board and Full Board basis options.